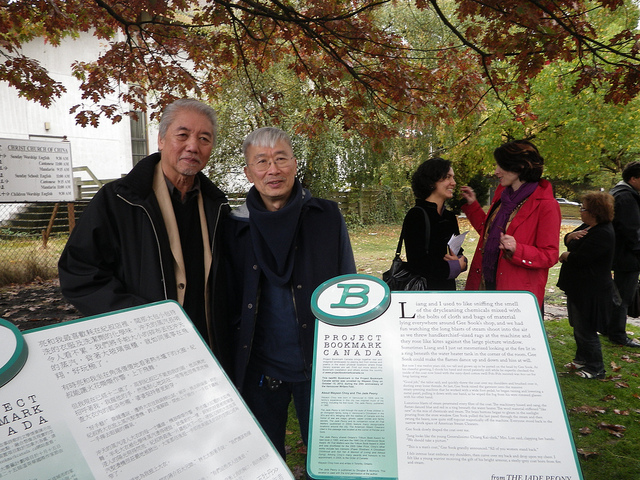 On October 15, 2012, Project Bookmark Canada installed in Vancouver a passage from Wayson Choy’s iconic Vancouver novel, The Jade Peony, on two plaques - one in English and one in Mandarin. Both these plaques were unveiled in the lead-up to the city’s annual literary festival, the Vancouver Writers Fest. The Bookmarks can be found at the intersection of Pender Street and Gore Avenue, in Vancouver’s Chinatown. Project Bookmark Canada is a national charity that places text from stories and poems in the exact, physical locations where literary scenes are set. The initiative has installed ten Bookmarks around Ontario, and recently unveiled another in Newfoundland. Miranda Hill, the organization’s founder and executive director, says that the Bookmark for The Jade Peony is a particularly significant milestone for the project. At the unveiling, Wayson Choy read the passage in English, and Anna Ling Kaye, President of the Asian Canadian Writers Workshop and Editor of Prism Magazine, read the passage in Mandarin. More than 150 people attended the event on the street corner in this busy commercial area, which is part of unceded territories belonging to the Coast Salish.